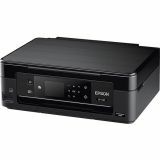 Epson Expression Home XP-440 Inkjet Multifunction Printer - Color - Packed with convenient and practical features, this all-in-one printer makes everyday printing a breeze. High-resolution, 2.7"" color LCD helps you quickly navigate through the menu options for simple setup and use. 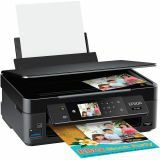 Built-in card slot lets you preview, edit and print borderless photos directly from the printer without requiring a computer. 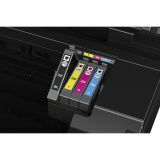 Plus, individual ink cartridges mean you only need to replace the cartridge that runs out. Wireless 802.11 b/g/n connectivity allows you to print from anywhere, with or without a network, from your iPad, iPhone, Android tablet or smartphone. Included bonus software lets you scan and share photos to Facebook and the cloud. And, its 100-sheet paper capacity means you'll reload paper less often. 3.50" x 5" 5" x 7" 8" x 10" A4 - 8.30" x 11.70" A5 - 5.80" x 8.30" A6 - 4.10" x 5.80" B5 - 6.90" x 9.80" Envelope No. 10 Executive - 7.25" x 10.50" Half-letter Legal - 8.50" x 14" Letter - 8.50" x 11" Photo - 4" x 6"